Unusual Activity at the Kanggon Military Training Area in North Korea: Evidence of Execution by Anti-aircraft Machine Guns? While examining satellite imagery of an area near the North Korean capital city, the Committee for Human Rights in North Korea (HRNK) and AllSource Analysis, Inc. (ASA) may have come across evidence of a ghastly sight: the public execution of several individuals by anti-aircraft machine gun fire. A military training area generally known as the Kanggon Military Training Area is located approximately 22 km north of the capital city Pyongyang (Pyongyang-si). Given the size, composition, and location of the training facility, it is likely used by both the students and staff of the elite Kanggon Military Academy (6 km to the southwest) and units from either the Pyongyang Defense Command or the Ministry of State Security. Encompassing approximately 12km2, the training area is composed of a number of dispersed small facilities. One of those facilities, located 1.5 km northeast of the small village of Sŏngi-ri, is a small arms firing range (39. 13 48.64° N, 125. 45 29.03° E). This firing range is approximately 100 meters long by 60 meters wide and consists of 11 firing lanes. A range control/viewing gallery and parking area are located immediately south of the firing range. A small drainage ditch horizontally bisects the firing range. 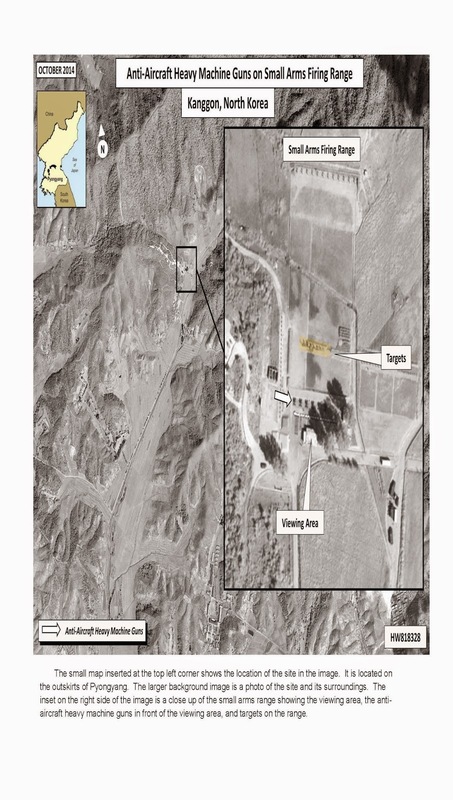 This firing range is typical of many ranges throughout North Korea and is designed for small arms training and maintaining proficiency for weapons ranging from pistols to light machine guns, and chambered for 7.62mm (the standard AK-47 rifle round) or less. Sometime on or about October 7th, 2014, some very unusual activity was noted on satellite imagery of the Kanggon small arms firing range. Instead of troops occupying the firing positions on the range there was a battery of six ZPU-4 anti-aircraft guns lined up between the firing positions and the range control/viewing gallery. The ZPU-4 is an anti-aircraft gun system consisting of four 14.5mm heavy machine guns (similar to a U.S. .50 caliber heavy machine gun) mounted on a towed wheeled chassis. It is neither safe nor practical to use such weapons on a small arms range, as the combined weight of fire from the six ZPU-4 (a total of 24 heavy machine guns) would quickly destroy the downrange backstop and necessitate reconstruction. A few meters behind the ZPU-4s there appears to be either a line of troops or equipment, while farther back are five trucks (of various sizes), one large trailer, and one bus. This suggests that senior officers or VIPs may have come to observe whatever activity was taking place. Most unusual in the image, perhaps, is what appears to be some sort of targets located only 30 meters downrange of the ZPU-4s. The satellite image appears to have been taken moments before an execution by ZPU-4 anti-aircraft machine guns. Busing in senior officers or VIPs to observe a ZPU-4 dry-fire training exercise at a small arms range amidst North Korea’s fuel shortages would make no sense. 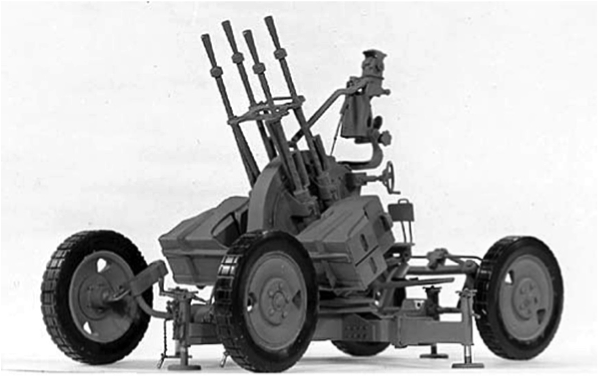 If the ZPU-4s were brought to the range solely to be sighted in, conducting this exercise at a 100 meter small arms firing range would be impractical. A live-fire exercise would be even more nonsensical. Rounds fired by a ZPU-4 have a range of 8,000 m and can reach a maximum altitude of 5,000 m. Positioning a battery of six ZPU-4s to fire horizontally at targets situated only 30 m downrange could have no conceivable utility from a military viewpoint. 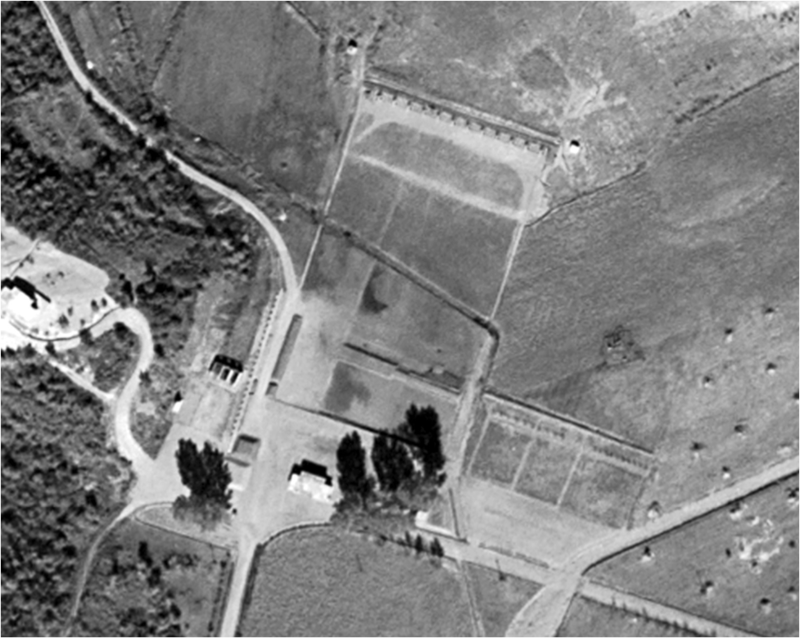 The most plausible explanation of the scene captured in the October 7th satellite image is a gruesome public execution. Anyone who has witnessed the damage one single U.S. .50 caliber round does to the human body will shudder just trying to imagine a battery of 24 heavy machine guns being fired at human beings. Bodies would be nearly pulverized. The gut-wrenching viciousness of such an act would make “cruel and unusual punishment” sound like a gross understatement. Given reports of past executions this is tragic, but unfortunately plausible in the twisted world of Kim Jong-un’s North Korea. In December 2013, following the execution of the leader’s uncle Jang Song-thaek, Choe Sang-Hun and David Sanger reported for The New York Times that Jang Song-thaek’s top two lieutenants had been executed using anti-aircraft machine guns. In the summer of 2013, South Korean intelligence officials and news media reported that purged North Korean artists had been executed using the same gruesome method. On April 13th, 2015, Dr. Stephan Haggard and HRNK board member Marcus Noland (Executive Vice President and Director of Studies, Peterson Institute for International Economics) drew attention to a quotation from New Focus International in a North Korea: Witness to Transformation article. New Focus indicated that, following instructions received from the top leadership, North Korea’s State Security Department (SSD) and Ministry of People’s Security (MPS) launched the so-called “9.8 measures” in the fall of 2014. The measures involved the further “militarization of State Security and People’s Security,” so that surveillance, control, coercion, and punishment could be carried out more effectively. Kanggon Small Arms Firing Range, October 16th, 2014, ZPU-4 systems or targets not present. Choe Sang-Hun and David Sanger, Korea Execution Is Tied to Clash Over Business, The New York Times, Dec. 23, 2013, http://www.nytimes.com/2013/12/24/world/asia/north-korea-purge.html?_r=0. New Focus International, North Korea’s State Security and People’s Security Ministries Implement ‘9.8 Measures,’ New Focus International, Apr. 12, 2015, http://newfocusintl.com/exclusive-north-koreas-state-security-and-peoples-security-ministries-implement-9-8-measures/. Stephan Haggard, Slave to the Blog: Trojan Horse Edition, Witness to Transformation (blog), Apr. 13, 2015, http://blogs.piie.com/nk/?p=14032. International Covenant on Civil and Political Rights, Article 6, http://www.ohchr.org/en/professionalinterest/pages/ccpr.aspx. OHCHR, Status of Ratification: Interactive Dashboard, http://indicators.ohchr.org/. Han Dong-ho et al., 2014 White Paper on Human Rights in North Korea, Korea Institute of National Unification (KINU), 115, http://www.kinu.or.kr/eng/pub/pub_04_01.jsp?bid=DATA04&page=1&num=40&mode=view&category=. Report of the commission of inquiry on human rights in the Democratic People’s Republic of Korea, UN Human Rights Council, 25th sess., Agenda Item 4, UN Doc. A/HRC/25/63, p. 12, para. 63 (7 February 2014), available at http://www.ohchr.org/EN/HRBodies/HRC/CoIDPRK/Pages/ReportoftheCommissionofInquiryDPRK.aspx (hereinafter “COI Report”). Voice of America (VOA), North Korea Human Rights Outlook for 2014…‘Concerning of Political Camps Expansion and Reign of Terror,’ HRNK Insider, Jan. 3, 2014, http://www.hrnkinsider.org/2014_01_01_archive.html. The views and opinions expressed here are those of the authors' and not those of any other person, organization, or entity; they are the authors' alone. Specifically, they do not represent the views of the Board of Directors of the Committee for Human Rights in North Korea (HRNK) nor necessarily reflect the official policy or position of HRNK.